People often ask me what I eat. I've been reluctant to share, because it feels egocentric and I'm a private person by nature. I also don't want people to view my diet as a universal prescription for others. But in the end, as someone who shares my opinions about nutrition, it's only fair that I answer the question. So here we go. In my food choices, I try to strike a balance between nutrition, cost, time efficiency, animal welfare, pleasure, and environmental impact. I'm the chef of my household of two, and I cook two meals a day, almost every day, typically from single ingredients. I prefer organic, but I don't insist on it. My diet changes seasonally because I grow much of my own food. This started out with vegetables, but recently has expanded to staple foods such as potatoes, flour corn, and winter squash. 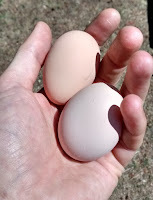 I also have a small flock of laying hens that turn table scraps, bugs, grass, and chicken feed into delicious eggs. The primary guiding principle of my diet is to eat somewhere between a "Paleolithic"-style diet and a traditional agricultural/horticultural diet. I think of it as a broad ancestral diet. Because it's partially inspired by agricultural/horticultural diets, starch is the main calorie source. My meals are organized around three food groups: a protein, a starch, and vegetables/fruit. If any of those three are missing, the meal doesn't feel complete. I'll start with those categories and move on from there. Is the "Obesity Paradox" an Illusion? Over the last two decades, multiple independent research groups have come to the surprising conclusion that people with obesity (or, more commonly, overweight) might actually be healthier than lean people in certain ways. This finding is called the "obesity paradox". Yet recent research using more rigorous methods is suggesting that the paradox is an illusion-- and excess body fat may be even more harmful to health than we thought. Introduction. What is the obesity paradox, and why does it matter?